CBRE reports infrastructure investment will lead to the growth of new urban areas, contribute to trade flows and the logistics and tourism markets, and impact real estate affordability. An artist's impression of Jewel Changi Airport. Safdie Architects, which is led by the man who designed Jewel and Marina Bay Sands, is believed to be part of a team in the running for the T5 project. Kuala Lumpur - Singapore High Speed Rail will reduce travel time from 4 hours by car to 90 mins by rail. CBRE has reported that ASEAN has been expanding, but shortfalls in infrastructure investment limit its growth. According to the Asian Development Bank, US$92 billion more in infrastructure investment is needed for the region to maintain its growth momentum and eliminate poverty. This gap in investment needs is increasingly being addressed by the various countries. It will allow the private sector increased opportunities for development, with multiplier effects for the economies and increasing the attractiveness of individual countries to foreign investment. On the real estate front, it allows for decentralised commercial clusters, more affordable and accessible housing options, and tourism growth. Plus, trade flows are expected to improve as a result of shorter transport times and lower costs. Asian Development Bank says US$92 billion more in infrastructure investment is needed for the region to maintain its growth momentum and eliminate poverty. For cities, metro lines will help ease congestion; for countries, it can make possible the growth of secondary cities. It will additionally help the region move towards economic integration, in line with the aims of the ASEAN Economic Community. ASEAN, which comprises 10 member states and a total population of 628.9 million was formalised in 2015 with the establishment of the ASEAN Economic Community (AEC). Individually, countries have been building up their own infrastructure prowess. Together, these acts connecting ASEAN will lead to the growth of new urban areas, and contribute to trade flows and the logistics and tourism markets, with subsequent implications for real estate. 1. Single market and production base Rail and road projects will facilitate the free flow of goods and people within the country and across national borders. 2. Competitive Economic Region Better transport infrastructure also will help to boost tourism and retail sector as locals and tourists alike can move around more easily, discovering non- traditional tourist spots or immersing themselves in the local culture. 3. Equitable Economic Development Planned infrastructure projects present opportunities in the growing secondary regions both for residential and commercial developments. This promotes a more inclusive and cohesive ASEAN. 4. Integration into the Global Economy Improved physical connectivity is set to bene t the logistics industry. This will eventually present ASEAN as a more attractive investment destination to the global economy. In a two-tier ASEAN market, upcoming infrastructure projects could change the dynamics of the regional economy. As developing ASEAN countries such as Cambodia, Laos and Myanmar evolve into low-cost production centres with the potential to replace China or the more developed ASEAN countries, the latter’s role in global value chains will change. A case in point would be Denso, a Japanese automotive components manufacturer, that opened its production plant in the Phnom Penh Special Economic Zone in 2015. The plant produces parts that will be transported back to its Thailand facilities for assembly, thereby reducing the cost of production and allowing its Thailand factory to become a regional hub focusing on the production of new products outside Japan. Due to such shifts, more developed ASEAN countries such as Malaysia, Singapore and Thailand will have to continue moving to higher value industries. For these countries, improving the urban transportation network and increasing their competitive advantage will be the key focus. Among the real estate sectors, the logistics sector should be the main beneficiary of ASEAN’s high levels of infrastructure investment in the short to mid-term, given increased connectivity within each country and between neighbouring countries. In the longer term, decentralisation within metropolitan areas and sub-national regions will provide plenty of opportunities for developers, owners and occupiers of space. Infrastructure development often brings about multiplier effects to the economy by increasing employment and private consumption. 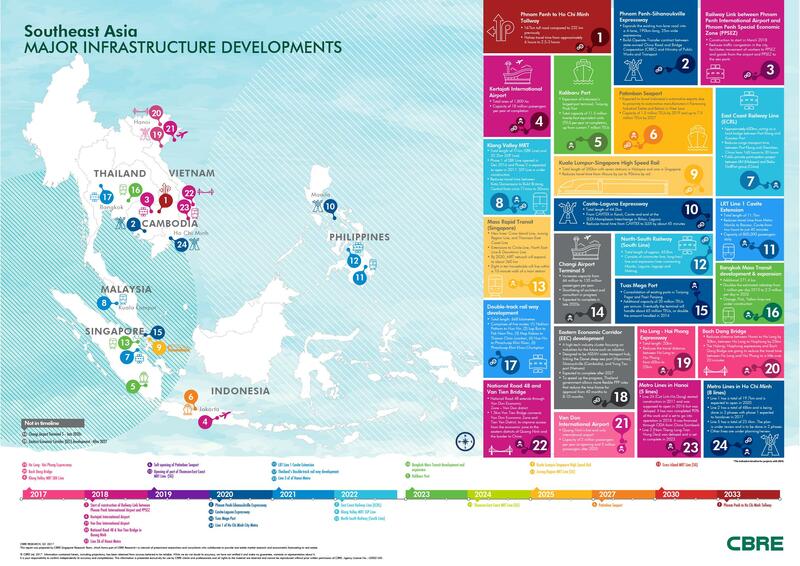 Infrastructure development in ASEAN is necessary and investment in this sector is timely. Prospects are promising for both the economy and real estate markets, however, whether these projects can truly be game-changers will depend on their execution. To download a copy of the CBRE Connecting ASEAN: Infrastructure, Integration & Real Estate Growth report click the link in the contact details section below. For more information or to discuss the findings of the report, phone or email Desmond Sim, CBRE Head of Research, Singapore and South East Asia, via the contact details below. For more information about global research, phone or email Henry Chin, Ph.D. CBRE Head of Research, Asia Pacific via the contact details below. What does China’s infrastructure masterplan mean for Asia?